Meanwhile, long-play competitors in the market 8 megapixel camera phone, Nokia still concentrate to improve the quality of products and services office software to block attacks from Canada. But on that has expired since release of the Nokia N86 8 MP. This product is the first Nokia mobile phone equipped with an 8 megapixel camera. Reasonable because the phone also has a 8 Megapixel ending for clarity. However, the design and premium features that are not much different from the previous phone (N85), N86 to make visible only to improve the camera only. Is that correct? Almost no matter who sets the phone with the phone before, but some of the key and laying a bit on the dimensions. N86 is certainly heavy enough to be put in pants pocket, the more weight than the N85. Design of this phone can be called dual slider. Where the top of the phone consists of a screen can be moved up and down. Design mobile phone is also found in the old phone like N95, Samsung SGH-i450 and N85. When the slider is opened up, we find a row alphanumeric keypad with good quality. Are the size and material of solid, keypad is comfortable to use. Meanwhile, when the slider is opened towards the other, then there will be a small section out, show some of the multimedia key. N86 screen using a new type that were used in the Nokia N85 and Samsung S8300 is AMOLED Touch Ultra. This screen is able to display the image more sharp and more energy efficient, this type of display shown in QVGA resolution, 2.6 inch diagonal and 16 million color depth. As a fellow brother's N Series, N86 using sophisticated software such as operating system Symbian S60 edition opens 3. This time he uses to update the version of the three that is also often called the feature pack (FP) 3. Many improvements, but still the same as the display interface and a mobile phone equivalent other S60 3rd edition. This is an excellent first feature Nokia N86 8 MP. From outside, this camera is very promising. Large 8 megapixel lens which has brought good enough to interpreters objects in images to digital images. That is, this image is large compared with the optimal lens 10 or 12 megapixel. In addition, the type carried by the optical camera lens again be trusted on the product Carl Zeiss. With the support of the flash type dual LED famous powerful without wasteful of energy, the N86's ability to provide a serious digital camera in the phone. View more details to the software also support that. The camera features the N86 has autofocus, image stabiliser and a number of professional camera settings. Seeing this, the quality of the images are very dependent acceleration of the lens. We can see the performance through some of the images we get. In general, many are not disappointing. However, like most of the nature of the flash, especially mobile phone Dual LED, beam rays that fall to the object images appear too excessive. This is common in the shooting range in minimal lighting conditions. Nokia N series mobile phones remain a multimedia. Although not a special interface that utilizes multimedia Navi Wheel as usual, the phone is still supported features for the latest mobile entertainment. We can enjoy music via the default music player, such as N series digital music player. Music player for a number of features such as the ability to play music files with the format mp3, wma, aac, eAAC and eAAC + support and information to the ID3 tags are perfect. Hardware support is also provided to encourage the player's ability. One of them is the two-speaker stereo with a microphone. Reminds us on the Nokia N95. Voters can be issued faster but not as good as the quality of the headset is the default. For that, the Nokia N86 also provides a portal specifically for the 3.5 mm audio jack. Besides can be used to use a headset to listen to our favorite music from the phone. Besides the music player, Nokia is also bringing technology Flash Lite 3 support for flash files, RealPlayer for playing video and a number of online support for uploading, downloading, and streaming media. With the mobile phone stand that is located at the camera, this phone can be used to watch videos without having to cling. This phone also provides storage space 8 GB of memory in the system. If that is still lacking, the MicroSD slot is also available and supports up to 16 GB. Nokia N86 using technology 3.6 Mbps HSDPA network. We can browse and download multimedia files quickly. Thanks to the support Symbian's browser and a number of links to interesting sites such as Youtube and Facebook, browsing activities become easier and more practical. Like most other new Nokia phone, N86 also has OVI. We can use the portal owned by Nokia, the start of creating an email account more easily, or just to share experiences via blogs photo. As a means of connection, we can take advantage of WiFi technology, Bluetooth, microUSB data cable and TV out. This mobile phone is also equipped with internal GPS receiver, the Nokia Maps and a number of other purposes. GPS can also be used to paste the information on the location of the camera image. Battery Type Lithium Ion 1200 mAh brought enough to provide power on the phone. However, as already suspected, this capacity can not be spelled out for the big mobile phone that brings almost all of the latest mobile phone ammunition. Lucky N86 8MP choose AMOLED screen and dual LED flash is more energy efficient. 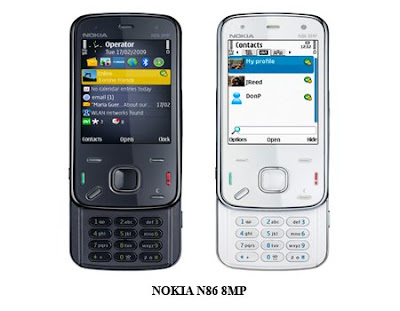 8MP Nokia N86 is a multimedia phone as well as an alternative device pocket camera that can be relied upon. Although the acceleration can not learn like most digital cameras, but the presence of the camera with the new technology is good enough to produce a collection of photographs and images to upload directly to the blog. Completeness of the multimedia features and connections is another strength of the N86. However, lack of improvement of the product before and practical only on the increase in the camera view is a source of negative market. Like most other new Nokia phone, N86 also has OVI. We can use the portal owned by Nokia, the start of creating an email account more easily, or just to share experiences via blogs photo.